Microscope is very pleased to present Moonley, the first solo exhibition of works by Ben Coonley. Microscope is very pleased to present Moonley, the first solo exhibition of works by Ben Coonley, whose body of works – including parodic instructional videos referencing current affairs and often featuring the artist, Otto his cat, and other characters such as a stick “trick” pony – have received attention from the Internet to underground and international film festivals and appeared at institutions including MoMA PS1 and the New Museum in New York. In Moonley, the artist continues to embrace purposefully lo-fi aesthetics while at the same time pushing the possibilities of consumer 3D technologies in new videos and installations made with a 360° 3D handheld camera as well as with a DIY stereoscopic 3D device using 1980s Fisher Price Pixelvision cameras. 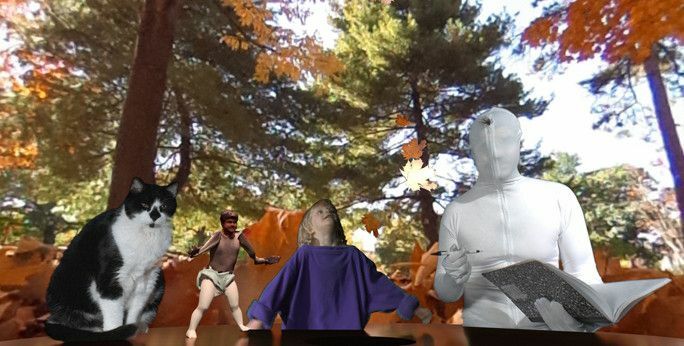 The centerpiece of Moonley is the virtual classroom installation “Trading Futures”, a 9-foot handmade cardboard geodesic dome housing a a 360° 3D video featuring a spandex-clad professor leading a discussion on financial derivatives trading and other subjects before his virtual children – a cat, a human daughter, a 3D model of a dancing baby – and the off-screen viewers of the work. Lucid fantasies and nightmares periodically interrupt the talk. A series of silent stereoscopic 3D Pixelvision video “Compositions”, variations on the well-known black & white “marble” composition notebook patterns, play on separate screens. For these works, Coonley rigged together two PXL-2000 video cameras, which record extremely low resolution 2D video onto regular audio cassette tapes. The flat views from each camera are combined and layered to create increasingly “mismatched” and glitchy illusions of three-dimensional space. Other works include the installation “Touching (Otto)”, a two-channel 360° 3D “performance for the camera” projected onto a domed cat litter box and starring Coonley’s cat Otto, encountering for the first time the palm-sized 360° camera, suspended on a string recording his actions simultaneously from all directions.